Rosaprima carries an impressive compendium of over 150 varieties of the most exclusive and elegant roses available. It is distinguished by the finesse, beauty and superb quality each rose brings to the collection. Each variety has been carefully chosen, some of which were developed exclusively for Rosaprima over years by the most prestigious breeders. This year, after long and thorough analysis, 13 new varieties made the cut to become part of Rosaprima’s showcase. We are very proud to present our latest additions that are certain to become classics in no time! Our first new addition to our exclusive collection for 2018, Finally is a vibrant red rose that exudes elegance with a touch of pizazz. Romantic, sophisticated and sensual, its intense color shades off to a lightly darker tone and speaks of love and passion. With its long-lasting vase life and amazing flexibility for bringing a sparkle to any type of floral arrangement, it is sure to become a favorite for years to come. The intense, hot yellow color of Light House will not go unnoticed. This rose will transmit all the energy of the sun, injecting you with a boost of vigor! Youthful and extreme, this variety is lush in petals all the while maintaining its classic elegance. A fantastic choice to add an invigorating cheer to your floral creations, Light House absolutely dazzles with its liveliness and luminosity. The latest garden rose (link to our garden roses) to be added to our collection, Mayra Pink, is a beautiful, light pink rose that opens all the way to a deeper pink in the center. Its plentiful petals ruffle at the edges giving this rose an exuberance reminiscent of a Spanish ‘bailaora’. Whether in a bridal bouquet or any type of arrangement, Mayra Pink will not only bring wonderful texture with a just a light touch of fragrance, but it will also compliment and add femininity, warmth and excitement to any occasion. This is one spectacular new variety in shades of deep, golden apricot that opens generously with rich, ruffled layers of petals with a subtle hint of green on the outside. Its frilly center gives it a romantic, vintage look that exudes elegance and character and ensures your arrangement will not go unnoticed! 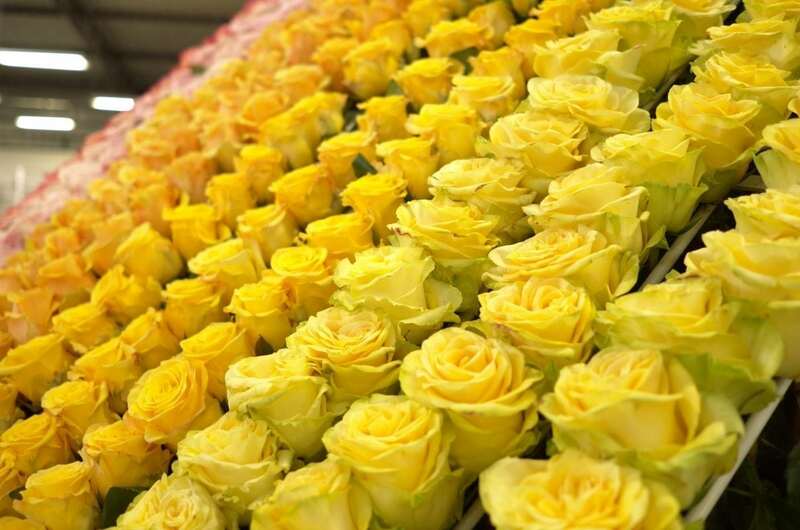 Taking you to the height of the summer, our breeders developed this garden rose variety in search for the perfect bright ‘Yellow’ to add luminosity and excitement to your flower creations. Country Sun opens from a ruffled cup into a well-defined, shapely rosette, revealing intense bright swirls at the center. This new Rosaprima variety inserts playfulness and joy to bouquets and arrangements, or on its own. It brings the summer sun be it winter, spring, summer or fall. Another new dazzling garden rose in our collection, this tea hybrid has a heart-shape creamy peach tone center with ruffled greenish petals on the outside. Dynamic speaks of life and has all the energy and freshness of nature, making it a fantastic rose to be paired with endless options of color palettes. This rose variety is another guaranteed showstopper with its extra-large buds and beautifully delicate and dreamy light pink shade. Sensual, hypnotizing, but highly elegant as a result of its classic shape, Rosaprima’s Christa presents an abundance of petals that have a gradation in color from a more intense pink in the center that swirls out softer and lighter as it goes away from the center. Christa personifies Goethe’s romance, lending a flair of passion in any room she inhabits. Rosaprima’s Gospel is another powerful yellow new variety that will impress and make any arrangement stand out. This beauty conjures memories of watching the sun come up on a glorious morning. With plentiful layers of bright yellow petals, a tinge of light green brush strokes on its outside shows off its artistic flair. Gospel is a fantastic addition to any arrangement symbolizing happiness and joy. Gospel is a sturdy rose with an excellent vase life making it an easy choice when thinking of long events that need not only beauty and personality, but also the supreme quality that Rosaprima is known for. Another spectacular new variety is this magnificent white rose developed by the prestigious flower creator Schreurs. Grown in Ecuador exclusively by Rosaprima, our CEO Ross Johnson also had the privilege of bestowing the name of Aspen on this variety. He was inspired by the eponymous town in Colorado, whose snowy slopes combine elegance and thrill in equal measure. Aspen exhibits abundant petals that open up to reveal a soft cream heart shape within its center. Yellow roses have been identified with appreciation, friendship, joy, and excitement throughout history and Rosaprima Super Sun certainly invokes such cheerful feelings. It is also proportionately sophisticated and refined in its classic shape and its copious petals. This new Rosaprima variety makes for a radiant option to brighten any floral creation. Last but not least in our introduction of new Rosaprima varieties is Confidential. An iridescent beauty with orange/peach tones and coral nuances, this stunning rose overflows with charisma. The large head concentrates its orange hue at the center and swirls outwards ending with a pink shade that leaves you spinning. Confidential is a knockout that will imbue its sassiness on any event. Before the end of the year, two more varieties will be launched. They will be kept under wraps in our greenhouses until they are ready to surprise you! One thing is certain, as with all Rosaprima roses: they will be gorgeous and they will be of the highest quality. Follow us on our Facebook page and Instagram account to keep updated. Rosaprima works closely with only the most prestigious breeders throughout the world. Our expert team curates the exclusive collection by observing, analyzing and intuiting each unique and spectacular rose variety. We are proud to be able to provide a special rose for every single occasion in life because we believe that every moment can be an extraordinary moment with our roses. For orders, please contact your sales representative at information@rosaprima.com, or for more information, visit our webpage at www.rosaprima.com. **Please note some varieties may bloom only during certain seasons or months. This entry was posted in RESEARCH & DEVELOPMENT. Bookmark the permalink.